"Hi Jason, I have now ordered this. Thank you so much for going to so much trouble for me. It is very kind of you. Have a good weekend. 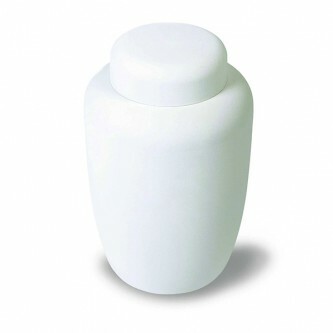 Kind regards, Vicki Sales"
This is the Pure White Cornstarch Bio Cremation Urn, it is a large, or adult sized biodegradable funeral urn of the very highest quality. This beautiful, environmentally friendly urns for ashes has been hand finished to the most exquisite standard, and is made entirely of natural materials. This is the Pure White Cornstarch Bio Cremation Urn, it is a large, or adult sized biodegradable funeral urn of the very highest quality. This beautiful, environmentally friendly urns for ashes has been hand finished to the most exquisite standard, and is made entirely of natural materials. This urn will start to biodegrade the moment it is subjected to moisture, either in the ground or in water. The time this process takes will vary, because it is entirely dependent on the environmental conditions. Alternatively, if it is kept in a domestic environment, it will last indefinitely, so it can be used as a permanent decorative urn. Our eco-friendly funeral urns are exquisite products that help to preserve the environment and protect the future of our planet, a natural alternative, in harmony with nature that really is a beautiful and fitting testimony to the memory of a loved one. DIMENSIONS - Approx: 26cm high and 17cm wide / 10¼ inches high and 6¾ inches wide. WEIGHT - Approx: 1.3kg or 3lb. CAPACITY - Approx: 3.9 litres or 239 cubic inches suitable for the ashes of an adult of approx. 110kg or 17 Stone. FREE SHIPPING TO UK ADDRESSES! It’s only when you’re holding your own urn that you can fully understand the work and craft that goes into every one of our cremation urns. We make every effort to display bright and clear images of our urns to help you make a confident choice, but sometimes even the best photograph does not do justice to its subject. After all this time, we really have learned to understand how you feel about the ashes inside your funeral urn, because we have heard the stories of thousands of families and sympathize with each of them. This is why we strive to supply products that deserve the cherished role they play in people’s lives, and consequently, the place they have in people’s hearts.